The Colour collection of household electrical switch and socket fittings are unique in its simple contemporary styling. With a range of 9 satin gloss painted colours onto metal back plates, plus a bespoke colour service for 10 plus individual items, this collection can suit all room settings whether minimalist, contemporary or traditional. 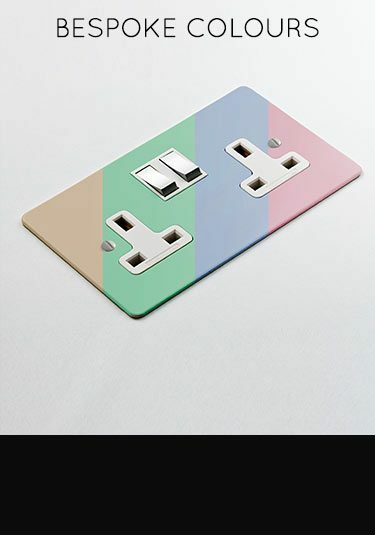 Within this colour range is a full collection of electrical fittings including TV, telephone, satellite points and cooker points plus a full range of plug sockets and rocker, toggle and dimmer light switches. Manufactured and designer in the UK for quality and longevity. 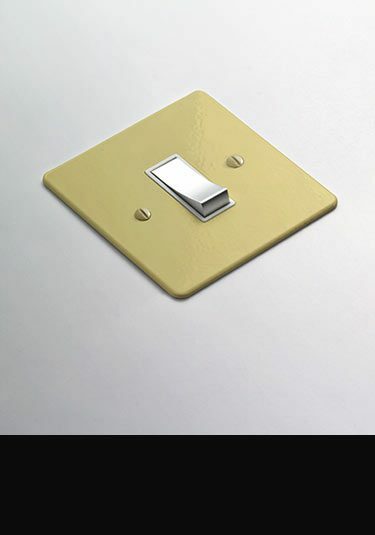 A luxury collection of electrical light switches finished in cream, painted onto a solid metal back plate. Made and designed in Britain. Full range of contermporary coloured electrical plug sockets and matching household sockets supplied in painted cream finish, onto a solid metal back plate. Luxury quality pale green painted light switches with solid metal back plate available in all size choices. 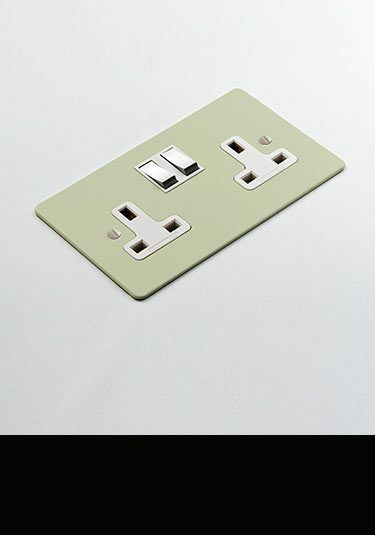 Stylish British made collection of coloured electrical plug sockets and switches supplied in a painted pale green, onto a solid metal back plate. British manufactured light switch in a pink painted finish onto a solid metal backplate. 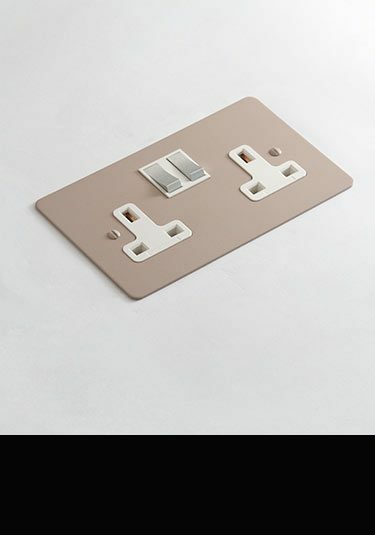 British luxury manufactured plug sockets and complimentary electrical fittings in a plaster pink painted finish, onto a solid metal backplate. Coloured light switches in a duck egg blue painted finish. These household switches can be supplied with rockers, toggles and dimmer switching. British designee with high quality manufacture. Full range of painted electrical sockets and fittings in a soft blue painted finish. British designed with high quality manufacture. British made collection of coloured light switches with a choice of toggle, rocker and dimmer switching. These designer household switches are finished in a contemporary grey painted finish. Full collection of luxury coloured plug sockets and complimentary household electrical fittings, that are supplied in a stylish French grey colour finish. British designed and manufactured. A lovely range of rocker, toggle and dimmer light switches that are finishes in a contemporary dirty yellow finish. 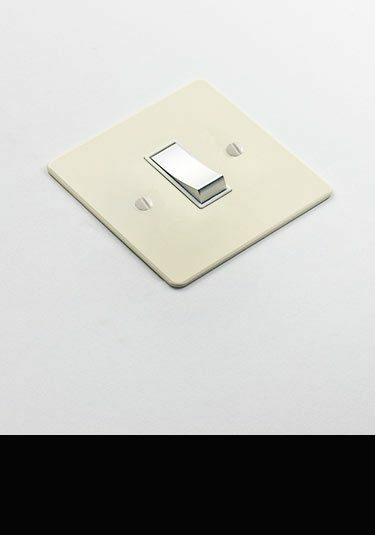 These household switches are very high quality and designed and made in Britain. A lovely range of high quality plug sockets and matching electrical fittings that are part of our coloured collection. These British made electrical household sockets are finished in a hard wearing pale yellow finish. Stylish collection of British made coloured light switches with toggle, rocker and dimmer switching choices. These painted switches are finished in a contemporary dirty brown finish. Full range of high quality plug sockets and complimentary electrical fittings in an exclusive grey painted finish. British designed and manufactured. 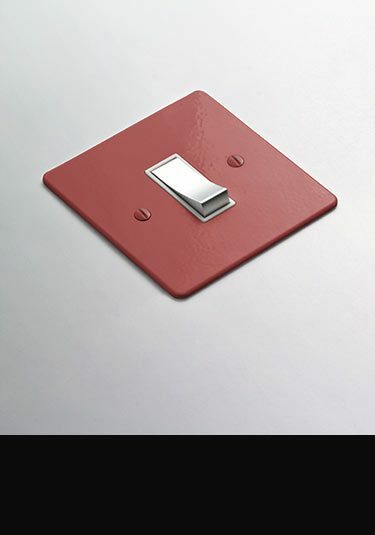 These contemporary red light light switches are made in Britain and part of a large designer collection of coloured light switches and sockets. All electrical fittings can be supplied with a choice between toggle, rocker and dimmer switches. Full range of high quality plug sockets and complimentary electrical fittings in a contemporary red painted finish. 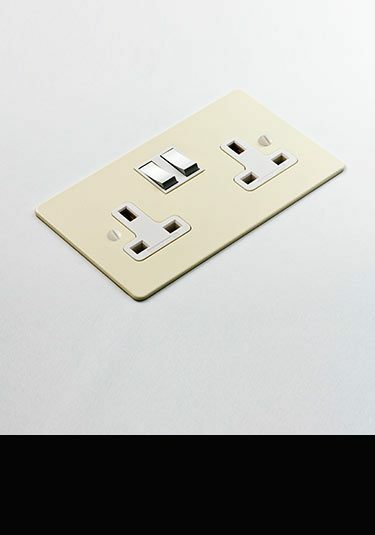 These luxury household sockets British designed and manufactured. 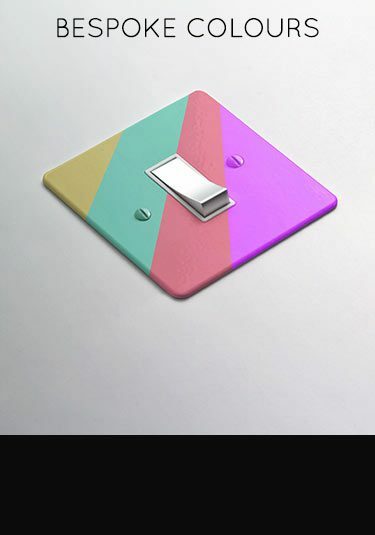 A bespoke colour collection of British made light switches supplied to your exact colour. Our custom coloured switches can be supplied with toggle, rocker and dimmer switching and are an exclusive addition to high quality design interiors. Luxury coloured plug sockets and complimentary electrical fittings that are supplied in the colours of your choice giving an exact finish to your interior design theme. All our sockets are British manufactured and designed.